Photos by Bryan Stevens The Polyphemus Moth rode to safety in the inside of an automobile after being rescued from a busy parking lot. My mom and I were heading toward the drive-thru at McDonald’s in Erwin when I saw something fluttering across the asphalt of the parking lot. The creature was brown and as big as a small bird — it even had wings! But, it wasn’t a bird. I realized that I was watching one of the largest of our native moths. 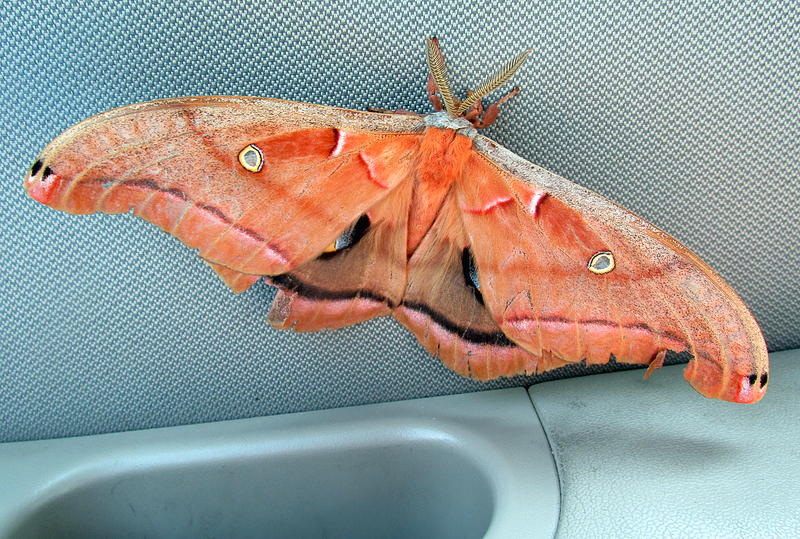 It was a little surprising to find the moth in the middle of a parking lot in the afternoon on a hot summer day. I pulled my vehicle into a parking space and captured the moth without too much difficulty. If left in the parking lot, the moth would likely have been run over. Although my mom agreed with the rescue — in theory — she wasn’t certain about sharing the car with a large, winged insect. After some persuasion, she accepted that the moth was absolutely harmless. Specifically, the large insect was a Polyphemus Moth, which is one of the biggest moths in the United States. These large moths often attain a wingspan of five and a half inches. 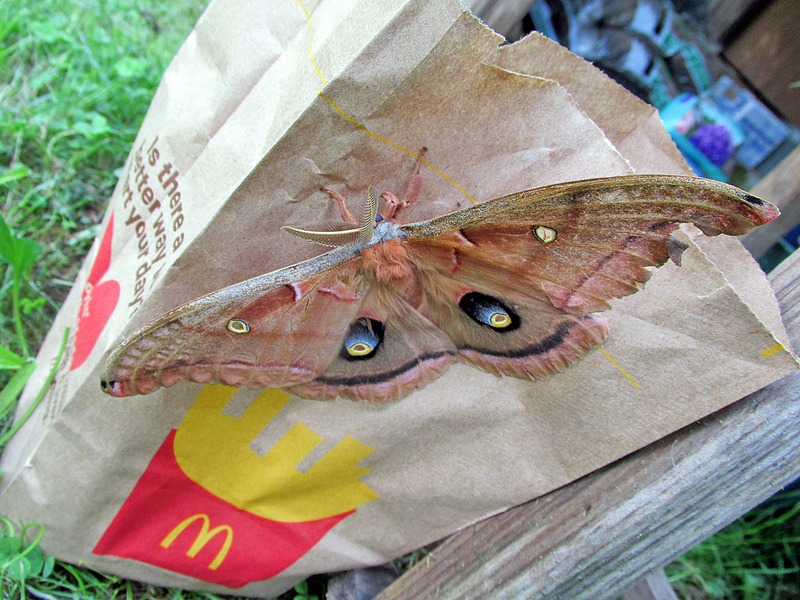 The rescued Polyphemus Moth clings to the side of a McDonald’s paper bag. Our rescued moth clung to the side of a McDonald’s paper bag that held one of the sandwiches in our order for the entire trip home. Once we arrived, I released the moth on a small oak-leaf hydrangea, took a few more photos and was pleased to see the large insect fly to freedom. I lost track of the moth once it landed in the thick branches of a yew tree. I was happy to secure the impressive moth a little more time to fly and perhaps even attract a mate. The brownish-yellow wings of the Polyphemus Moth show wavy, black and white lines. Each forewing is also decorated with a small, mostly yellow eyespot, as well as larger blue, black, and yellow eyespots on the hindwings. The underside of the moth’s wings look like dead leaves, which provides excellent protective camouflage. The eyespots are important in warding off potential predators. 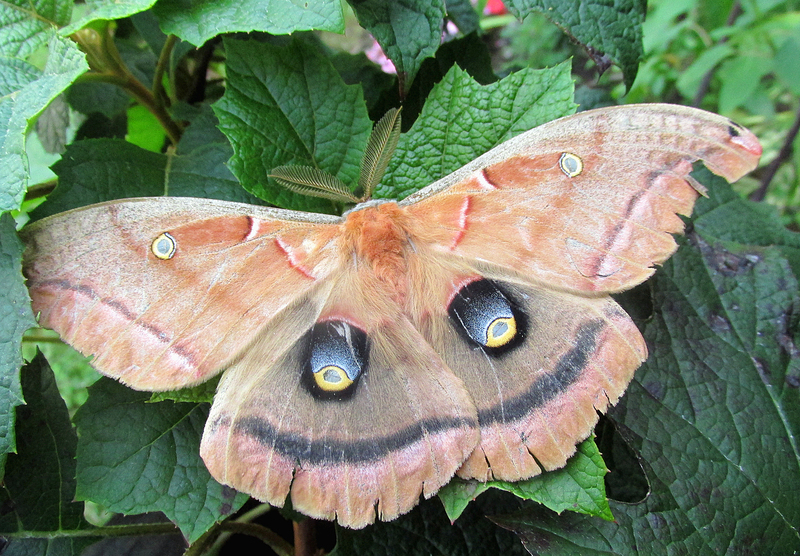 When a Polyphemus Moth spreads its wings, the eyespots resemble the large eyes of owls and other predatory birds. This display may be more than enough to discourage many predators, which can include mice, squirrels and small birds. Like most moths, they are usually nocturnal, which makes me wonder what happened to the moth I rescued to have it fluttering around on a sunny afternoon. 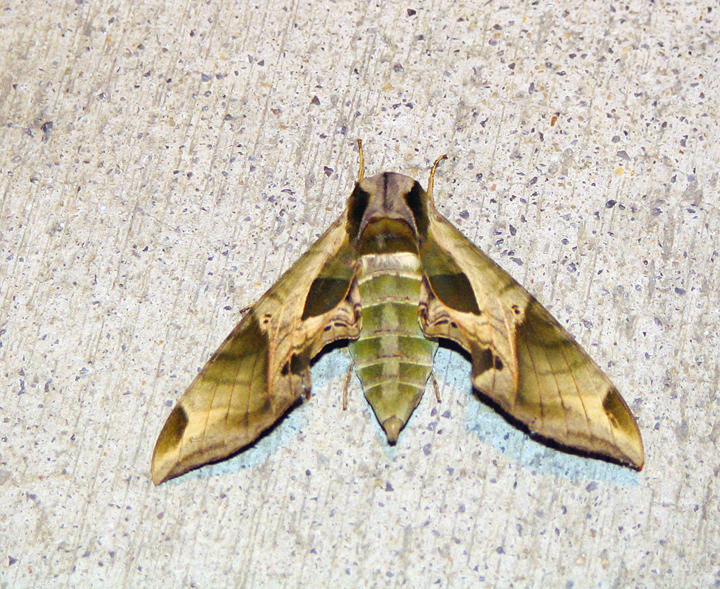 After dark, bats are major predators on these large moths. Polyphemus Moths are usually found in forests, but they are also present in such habitats as marshes and parks. Like all moths and butterflies, the Polyphemus Moth starts life as a caterpillar. Host plants fed upon by the caterpillars of this species include many trees and shrubs, including oaks, maples, pines, birches, American hornbeam, hawthorns, American beech, ash, witch hazel, black walnut, yellow poplar, black cherry, quaking aspen, elderberry, alders, sassafras, blueberries, grapes, willows, hickories, elms, chestnuts and American sycamore. 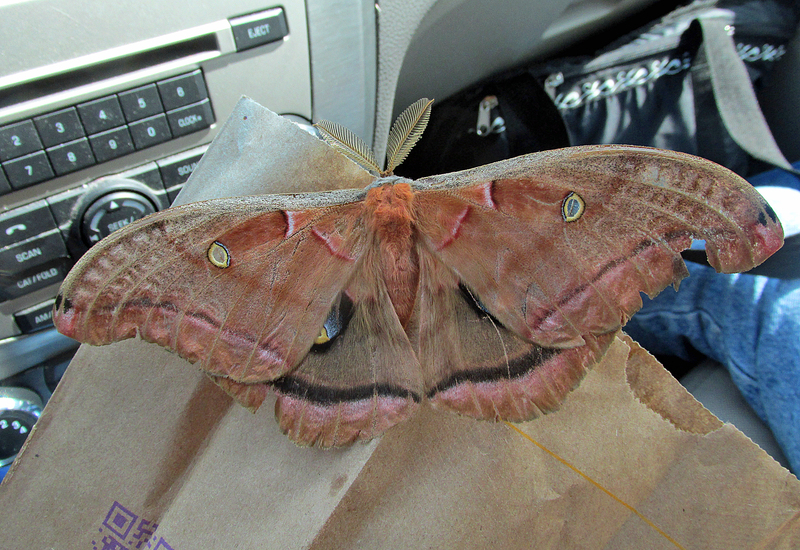 The rescued Polyphemus Moth got a ride to safety. Polyphemus caterpillars grow rapidly as they feed on the leaves of any of these host plants. As they grow, they will molt their skin four times. After the final molt, the caterpillar will fold a leaf around itself to enclose and protect its silken cocoon. Caterpillars that enter a cocoon early in the season will emerge during the summer months as moths. However, caterpillars that proceed to the cocoon stage of their life cycle in late summer or early fall will spend the winter months inside this silken enclosure. In such cases, adult moths will not emerge until the following spring, usually in May. Adult Polyphemus Moths do not feed. Their only focus during the entirety of their short lives as moths are to find mates and reproduce. Female moths attract mates with pheromones, which are chemicals emitted by a creature that triggers a social response in members of the same species. Male moths even have specialized feathery antennae to help them detect the pheromones released by females. 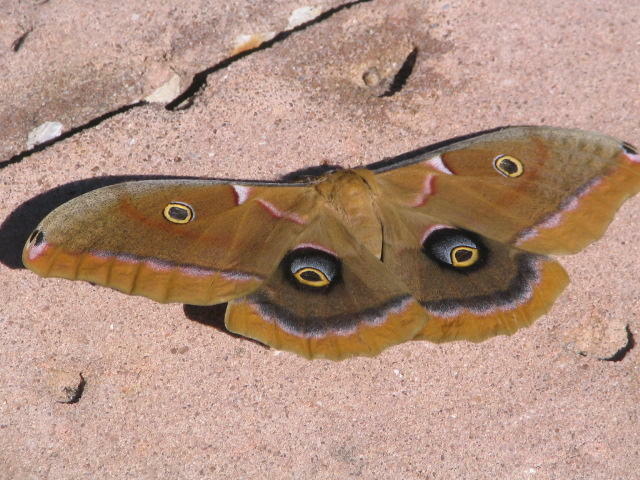 The moth is named for Polyphemus, one of the prominent giant Cyclopes in Greek mythology. 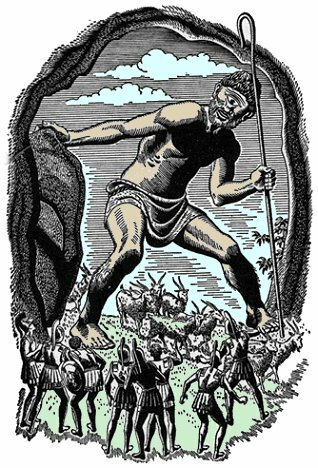 Captured by the enormous Cyclops, Greek hero Odysseus and his men blinded the giant’s one eye before escaping his cave. The Polyphemus moth is a member of the family Saturniidae, also known as “the giant silk moths.” Other well known moths in this family include the Luna Moth, Imperial Moth, Promethea Moth, and Regal Moth. In order to learn more about birds, birding and various other topics related to the natural world, friend Bryan Stevens on Facebook at https://www.facebook.com/ahoodedwarbler. He is always posting about local birds, wildlife, flowers, insects and much more. If you have a question, wish to make a comment or share a sighting, email him at ahoodedwarbler@aol.com. This Polyphemus Moth was photographed at Walt Disney World Resorts in Florida in 2007. This entry was posted in Birding, Birds, Moths, Uncategorized and tagged Birding, birds, Bristol Herald Courier, Bryan Stevens, Carter County Compass, Elizabethton Star, Erwin Record, Feathered Friends, McDowell News, Moths, Our Fine Feathered Friends, Polyphemus Moth, The Erwin Record on August 9, 2015 by Bryan Stevens.